We all know that the iOS devices are worth their weight in gold as far as parenting goes. As a Geek Mom, it’s one of my favorite sneaky ways to get education in to my son’s life while he thinks he’s getting rewarded by playing with the iPad. But it can get a little overwhelming when it comes to selecting the right app, not to mention knowing whether or not it’s going to be good quality. You may have heard of StoryChimes by Siena Entertainment already. Their interactive books are available on iPhone and iPhone touch, and bring stories to life for little kids. But their new app, StoryChimes Songbook, brings it all to a new level (and is particularly awesome on the iPad). The StoryChimes Songbook does something really exciting: it brings music into the mix. If you’ve read my posts over the years here and on GeekDad, you’ll know that I’m a huge proponent of education through music. And when reading and music go hand in hand, magic happens. Songs help memorization, and as each song highlights the words being sung through the story, it helps early readers (like my five year old) follow along. Not to mention, music is simply great for your brain! But I’m getting a little ahead of myself. The absolutely coolest thing about StoryChimes Songbook is that they’ve made some of the Lennon/McCartney songbook available (as a HUGE Beatles fan, this is extremely exciting!). Songs like “Let it Be,” “Golden Slumbers,” and “All You Need is Love” are all beautifully illustrated and sung. And, you can even learn to play the songs with the included keyboard function in the game. My son’s favorite part is finding all the little hidden easter eggs on each page, as each book has different elements you can poke. They spin, fly, and animate in response, eliciting all kinds of giggles from the preschool crew. And I suspect, even younger kids will get a kick out of it. 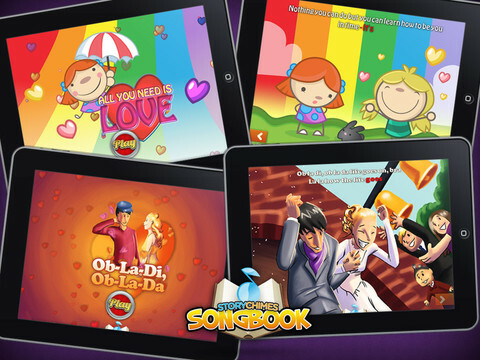 StoryChimes SongBook is a whole new way for kids and parents alike to experience their favorite songs! Each song has its own beautifully illustrated story, animations, interactivity and sounds. Plus, you can learn how to play these songs on the included piano! Prepare to take your songs on a whole new illustrated and musical journey! Great new songs every month! Learn to play your favorites on the included piano! Sing along in karaoke mode! Connect with friends and family to let them know what you’re reading and listening to. The app itself is free, and prices vary on songbooks from free (with the included ABC song that my kiddo adores) to $2.99, and the catalog contains other favorites like “Love Potion No. 9” among others. There is even a songbook of 12 Lennon/McCartney songs for just $9.99. You can download StoryChimes Storybook online at the App Store. StoryChimes is a featured GeekMom sponsor; products provided for promotion. One Response to GeekMom Feature: StoryChimes Songbook! I see and downloaded the app, but can’t find the songbook of 12 Lennon/McCartney. I only show you can purchase the songs individually.